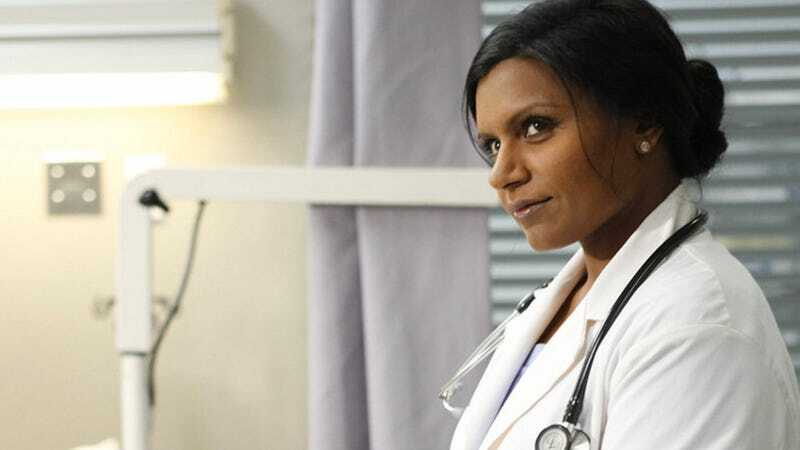 The numbers are in for Tuesday night TV, and The Mindy Project did okay. Not great. Entertainment Weekly calls the show's debut "a bit" of a disappointment, with 4.7 million viewers and a 2.4 ratings share. Still, that was enough to beat The New Normal on NBC. As the LA Times reports: "NBC pulled in more total viewers, 5.1 million versus 4.7 million, but that margin consists mostly of older viewers whom advertisers are less interested in." Huh. Ok. I was a little shocked to see the photo of her writing staff on premiere night that Kaling posted to Instagram: she was surrounded by a sea of young men in suits, with one lone additional woman perched off to the side of the group, nearly out of the frame. Young white men in suits, I should clarify: Kaling appears not to have hired any minorities to write for her show. "That's quite a sausage fest," reads one of the comments on the photo. "Mindz, where's all them female writers at??" asks another fan. Still: She's calling the shots, and having a primetime network drama in the hands of a woman of color is a big deal. As you may recall, Scandal is the first ever network drama written by and starring a black woman, and remains the only current network drama with a black woman in the leading role. A recent piece on the Huffington Post points out that there are quite a few actors of color working this TV season: Lucy Liu on Elementary; Giancarlo Esposito on Revolution; Anthony Anderson and Tempestt Bledsoe on Guys With Kids; Vanessa Williams on 666 Park Avenue; Jon Cho on Go On and Andre Braugher on Last Resort, among others. In truth, neither [NBC nor Fox] will necessarily want to shout those numbers from the rooftops (and neither one did in press material sent out Tuesday). But Fox looks much stronger for the night overall, because it's creating a solid comedy lineup that delivered solid if not spectacular ratings across the grid.